The Floral Celebration Garden conveys warmth and happiness and makes for a charming gift no matter the occasion. Blue delphinium, orange roses, purple statice, red carnations, white buttons, and yellow Viking poms are hand-arranged by a local florist for a truly colorful bouquet. 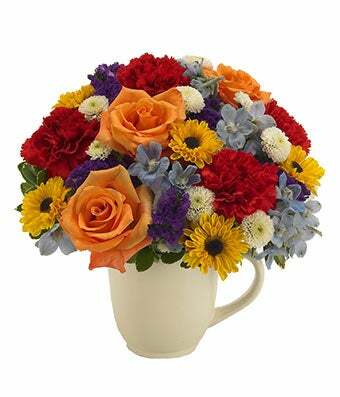 Arriving in a resuseable white mug, the bouquet can also be delivered today. Measures 10"H by 10"L.